v = √(γP/ρ) where γ is the ratio of specific heats of the gas, P is the pressure of the gas and ρ is the density of the gas. (2) A tuning fork of frequency 512 Hz resonates with the air column in a pipe of length 15 cm closed at one end. This tuning fork does not resonate with the air column in any shorter pipes. For which one of the following closed pipe lengths will this tuning fork exhibit resonance with the air column? 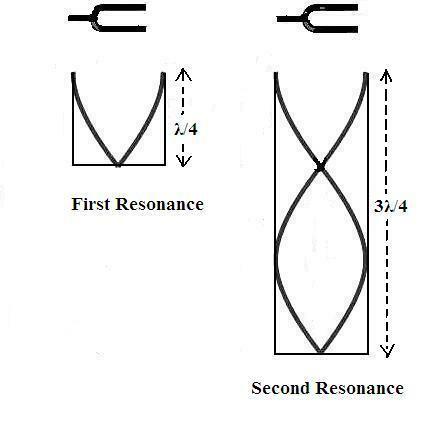 Since the tuning fork does not resonate with the air column in any shorter pipes, the resonating length is equal to λ/4 where λ is the wave length of sound in air. In this case there is a node at the closed end of the pipe and the next antinode is at the open end (Fig.). If the length of the pipe used is an odd multiple of λ/4, resonance will occur since in such cases the open end can be an antinode. Thus resonance is possible only if the closed pipe lengths are λ/4, 3λ/4, 5λ/4, 7λ/4 etc. [Note that a standing wave can be obtained in a closed pipe with consequent resonance only if the the closed end is a noe an the open end is an antinode]. Since λ/4 = 15 cm we have 3λ/4 = 45 cm, 5λ/4 = 75 cm, 7λ/4 = 105 cm and so on. Option (c) gives the length of the pipe as 45 cm and it is the correct one. The natural frequencies of vibration of a string are integral multiples of the fundamental (lowest) frequency. If the fundamental frequency is n, the frequency of the first overtone (or, the 2nd harmonic) is 2n. The frequency of the 2nd overtone (or, the 3rd harmonic) is 3n and the frequency of 3rd overtone (or, the 4th harmonic) is 4n. 3n = 3f/4 from which n = f/4.